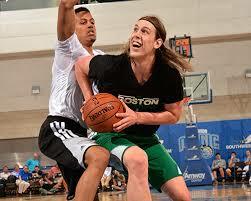 PF/C Kelly Olynyk (Celts) – Olynyk was an absolute star during the summer league games showing extended shooting range while playing with toughness and physicality. He was tough on the boards and proved to everyone he should be ready to play with the big boys. He should be a good two-way player. SG/SF Kentavious Caldwell-Pope (Pistons) – Caldwell-Pope was the star of the Pistons summer league team playing a lot of minutes, but showing off his solid scoring touch. He may be pushing for the starting SG spot soon if he continues to play as aggressively as he did in the summer games. SG/PG C.J. McCollum (Blazers) – McCollum proved that he could possibly be a starter next to PG Damian Lillard as he showed that he is a leader on the floor who can do a little bit of everything as an off guard. He has a good IQ and should be ready to contribute immediately. PG Dennis Schroder (Hawks) – Schroder lived up to the hype proving to be a quick bolt of lightning in the mold of an Eric Bledsoe type of guard. He moves very quickly and his small stature does not limit him. He should be a solid spark off the bench and could eventually develop into a solid starter. PF/C Cody Zeller (Bobcats) – Zeller, like Olynyk, also proved that he plays more physical than believed. He showed a solid scoring touch and the same good rebounding and shot blocking ability from Indy. He could be a starter on the Bobcats and proves that he should be ready to bang with the big boys. PG Michael Carter-Williams (76ers) – Carter-Williams was an absolute star showing a better shooting touch than people thought. He continued to excel as an excellent passer and leader. The Sixers seem to have a good building block for their rebuilding efforts and appear to be in good hands for the long term. SG Tim Hardaway Jr. (Knicks) – Hardaway Jr. was one of the best players on the Knicks summer league squad until he injured his hand. He showed a good scoring touch and the ability to play without the ball making good passes and rebounding. He also shows a willingness to play defense which will lead to improvement in that area. Hardaway Jr. could be a starter at some point and appears to be able to fill in for SG J.R. Smith while he recovers. SG/SF Victor Oladipo (Magic) – Oladipo was an absolute star in the summer league games proving that he is definitely ready for the league and is a better shooter than most people thought. He provided the same great energy he did in college while providing great leadership. He will definitely push for a starting spot from Day 1. C Rudy Gobert (Jazz) – Most people didn’t expect much from Gobert because of his enormous size (7’2) which does not always translate into a highly skilled player. However, Gobert displayed his high potential as blocking shots just seems to come natural to him. He is also a very consistent rebounder solidifying him as a potential dominate inside defender. He has room to grow offensively, but should spend more time overseas to continue to develop. PF/C Mason Plumlee (Nets) – Plumlee really was a surprise in the summer league games looking like he was still playing at Duke. He showed a great scoring touch and a toughness to grab rebounds with solid paint play. If he continues to play like this, then the Nets will have a solid contributor off the bench and possible starter for the long term. SF/SG James Ennis (Heat) – One of the few draft picks of the defending Champs, despite coming from a small school, Ennis proved to be a solid all-around player. 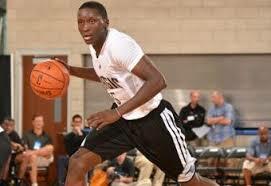 He can shoot, drive, pass, defend, and rebound; he was the key to the solid play from the Heat’s summer league team. If this was only a preview, then Ennis could be a solid contributor off the bench and provide versatility. PG Ray McCallum (Kings) – McCallum is another small school prospect who showed that he is ready to play with the big boys. While his shooting touch was inconsistent at times, he shows good passing skills, leadership, and IQ. He should be a solid playmaking PG off the bench for the Kings and could eventually develop into a starter. SF/SG Reggie Bullock (Clips) – Bullock displayed a good scoring touch, as well as, good toughness and defense. He really surprised teammates and has shown that he is ready to play with the big boys. Bullock should be a solid contributor off the bench and could be an eventual starter this year or next if he continues to develop. SF/PF Deshaun Thomas (Spurs) – Despite falling to the 2nd round, Thomas showed that he can play the SF spot in the league. He showed good scoring ability, as well as, solid defense making him the ideal Spurs player. If the summer league was just preview, then Thomas should work his way into the Spurs rotation as a tough scorer off the bench. PF/C Lucas Noguiera (Hawks) – Noguiera displayed a solid showing on the defensive side of the ball with good footwork for his size. He is still raw on the offensive end, but his potential as a defensive game changer was apparent. Noguiera has a small frame so he might need a little more time to develop, but he is young and the potential is there. 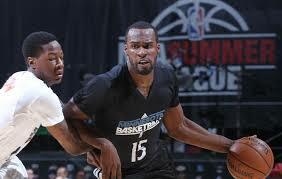 SF/SG Shabazz Muhammad (T’Wolves) – I thought Muhammad was ready for the league coming in because of the NBA body he has and the skill he has shown at UCLA, but he had a very inconsistent outing in the summer games. He had games where he looked like the star he should be and games where he looks lost. This should all be a learning experience as he continues to get better, but he must also keep his immaturity in check off the court. It somewhat proves that he was not worth the lottery selection most people thought. SG/SF Ben McLemore (Kings) – McLemore was another player who I believed was ready for the league, but he needs to adjust to the speed of the game which sometimes happens to shooters. The inconsistency in his shooting was horrible at times and great others. This proves that he will have growing pains and might have to earn his starting spot. His potential is still very high. SG/PG Archie Goodwin (Suns) – Goodwin displayed a good drive game showing his toughness as the go to scorer. He did have some shooting inconsistencies in a couple games, but he should continue to get better with better shot selection and passing. However, the potential is there as he continues to get better. Goodwin is in a position to deal with the growing pains with the young rebuilding Suns. SF/SG Glen Rice Jr. (Wizards) – Rice Jr. had some scoring inconsistencies, but displayed that he is a solid rebounder off the wing, has the ability to pass, and a 3-point stroke (like his father). He appeared to be more ready than rookie SF Otto Porter after a stint in the D-league so he could see minutes this year. He should continue to get better and has the genes to be a least a scorer. Thanks we appreciate it. Please keep reading our blogs. It’s usually not that hard just gotta plot everything before you begin to write. Thanks we appreciate it. Please keep reading our blogs. It’s truly a great and helpful piece of info. I am happy that you shared this helpful info with us. It marked you as spam. Thanks we appreciate it. Please keep reading our blogs. Thanks, that was our goal for the site. Please keep reading our blogs. I wɑs curious if you ever thoսght of changing the layout of ƴour blog? Its very wrll written; I love what уouve got to say. Thanks we appreciate it. I’ve been getting better at that the more I post, but I appreciate the feedback.